You wanna know what is even better then the citrus? 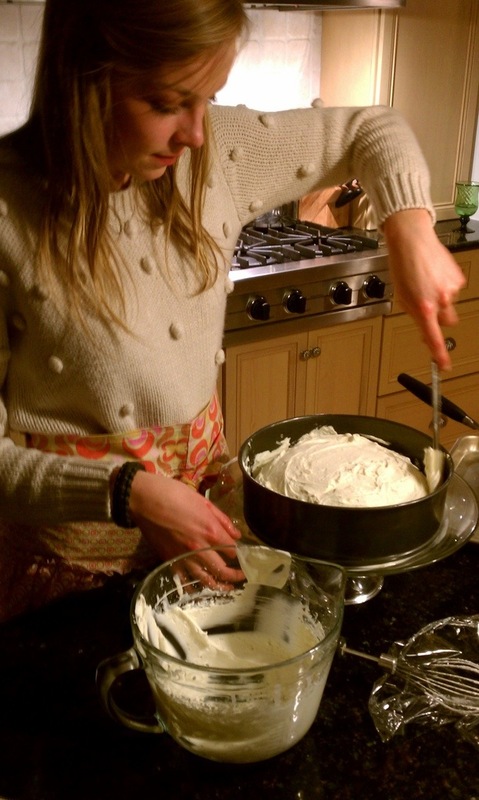 Having someone else bake the dessert for you!!!! As most of you know I cater. So, to have someone else do the cooking/baking and invite you to just come and enjoy…..right on sista! Just like Nellie always says, “even a peanut butter & jelly sandwich taste better if someone else made it for you!” My dinner last night was A LOT better then a pb&j! 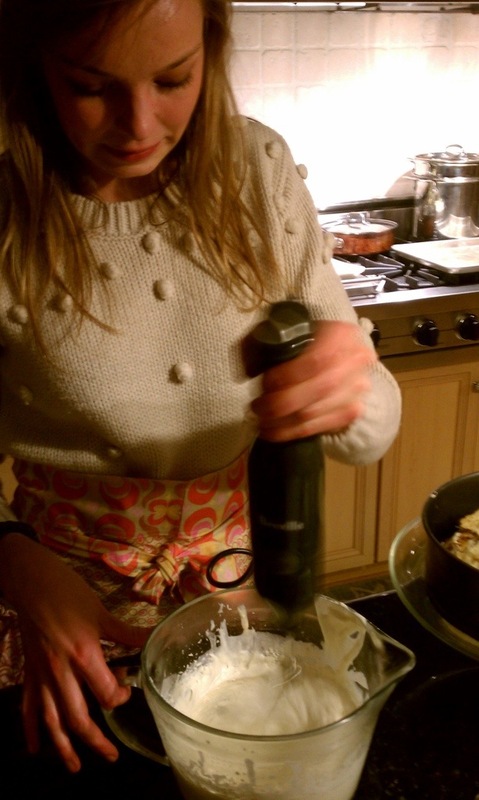 So, I’m sitting here at dinner almost finished, and then Hanna (cousin) gets up to make dessert. And I can never pass up a blogging opportunity! 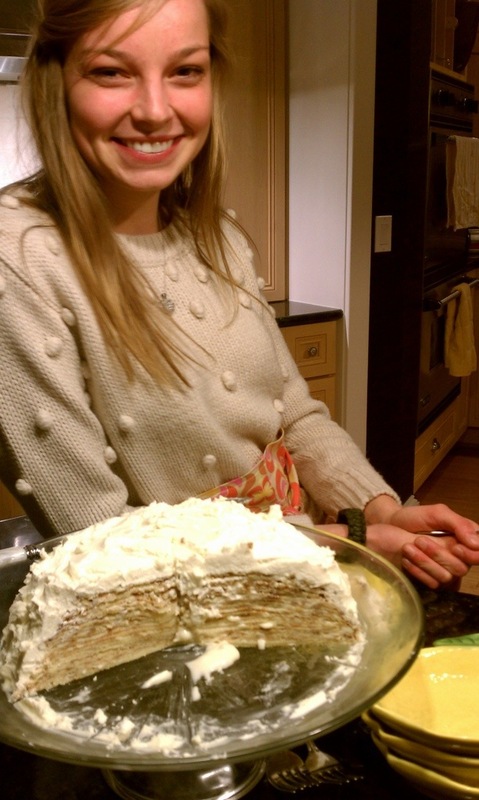 I truly enjoyed watching Hanna Banana make this dessert. She is a senior in high school. But, she has got crepe making down as if she was a little old French lady standing on a cobbled stone street in a village in France with her food cart full of baguettes. This dessert looks slightly complicated, but don’t let that fool yah. It’s easy! And so worth maybe a couple of burnt fingers trying to flip a crepe! Once you flip the crepe it only cooks for another remaining minute. It’s very quick! 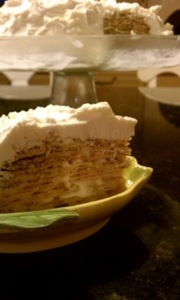 Once you have completed all the layers, cover the crepe cake with the most heavenly whip cream EVER! The slices were served on the cutest lemon plates! Thank you Hanna, it was delightful! Crepes: Combine all ingredients in a blender. Puree until smooth and thoroughly combined, about 1 minute. Transfer to a bowl, cover, and refrigerate until cold, at least 2 hours and up to overnight. Vigorously stir batter until smooth again. Melt 1/2 teaspoon butter in a 10-inch nonstick skillet over medium heat. Tilt skillet at a 45-degree angle, pour 1 ounce batter (slightly more than 2 tablespoons) into skillet, and immediately swirl and shake skillet in a circular motion to evenly distribute batter in a thin film across bottom. 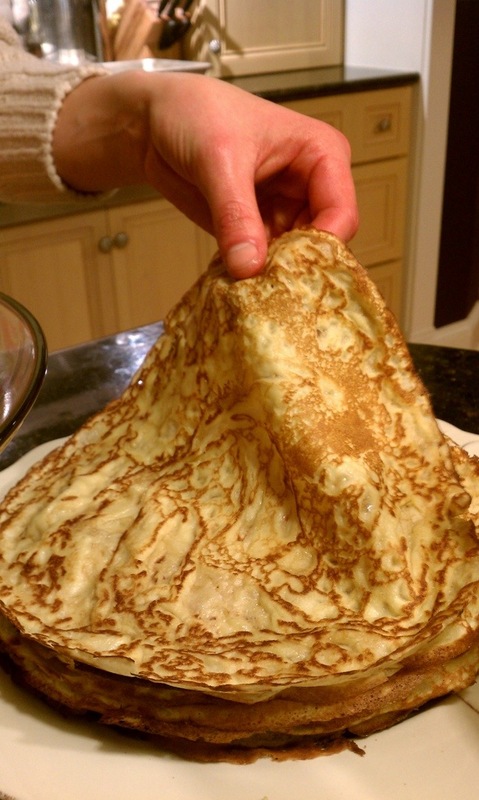 Cook until edges of crepe turn golden, about 45 seconds. 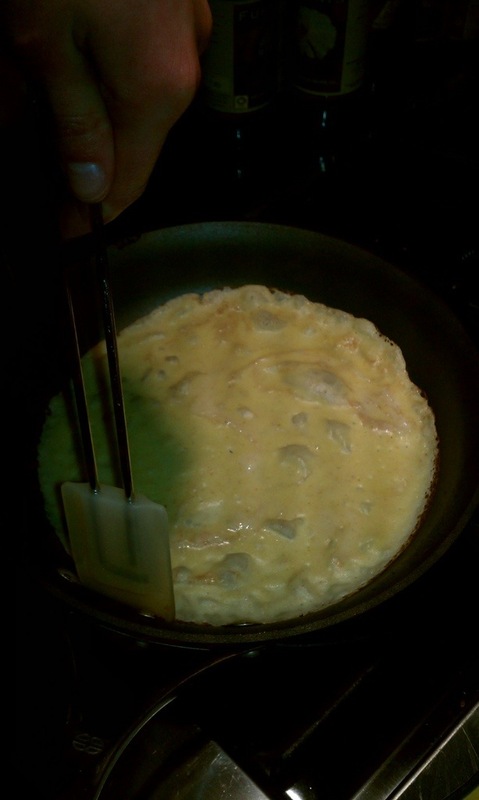 Carefully flip crepe, and cook just until set, about 30 seconds. Transfer to a paper-towel-lined plate. Melt another 1/2 teaspoon butter, and continue cooking crepes in the same manner, mixing batter with a spoon or ladle between crepes and stacking cooked crepes on top of one another (you should have 20 to 22 crepes). Let crepes cool completely, about 30 minutes. Lemon curd: Beat together butter and sugar with a mixer on medium-high speed until light and fluffy. Reduce speed to low, and add whole egg. When thoroughly combined, gradually add egg yolks, then lemon juice (the mixture will appear curdled). Transfer mixture to a small saucepan, and cook, stirring constantly, over medium heat until thick enough to coat the back of a wooden spoon, 5 to 7 minutes. Transfer to a bowl, cover surface of curd with plastic wrap, and let cool completely in the refrigerator, about 2 hours. Assembly: Whisk together 1 1/4 cups cream and 3 tablespoons sugar until soft peaks form. Fold a third of the whipped cream into lemon curd with a rubber spatula until thoroughly combined. 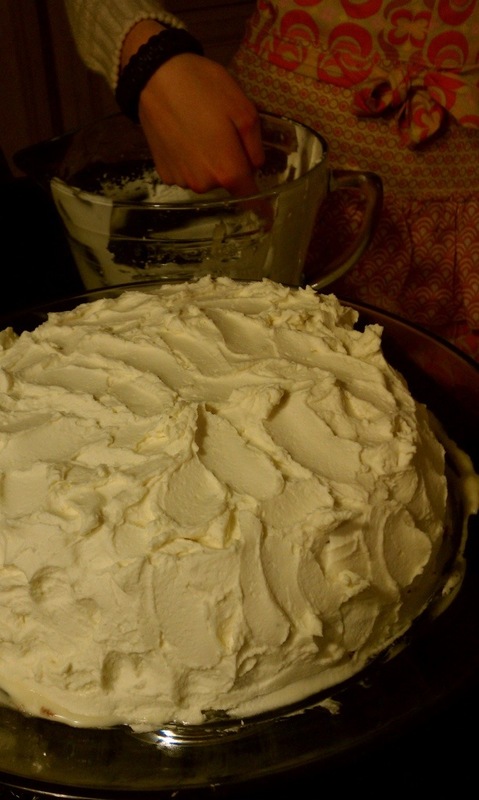 Gently fold cream-curd mixture into remaining whipped cream until thoroughly combined. For a neat presentation, make a frame on a 12-inch cake plate with 2-inch-wide strips of parchment. 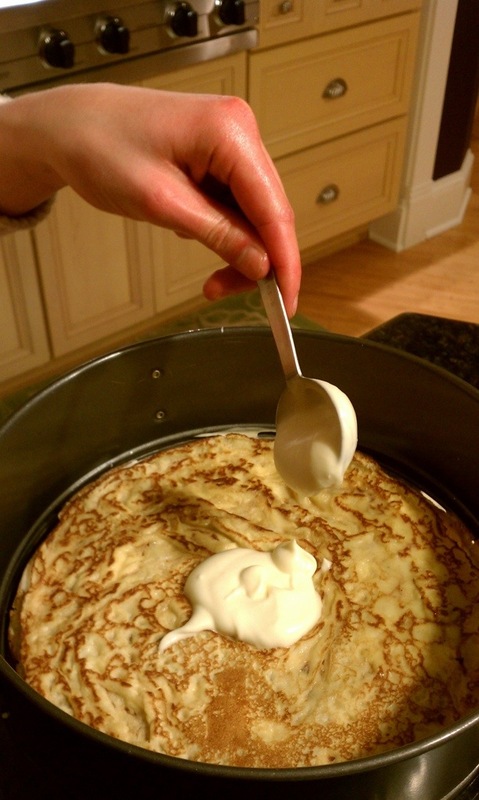 Place 1 crepe in center of plate (the outer edge of plate should be covered with parchment), and spread 3 tablespoons curd mixture evenly over crepe. 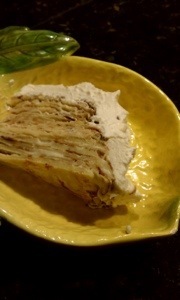 Repeat layering with remaining crepes and curd mixture, ending with the last crepe. Whisk together remaining 1 1/4 cups cream, the mascarpone, the remaining 3 tablespoons sugar, and the vanilla until soft peaks form. Spoon mascarpone cream on top of cake, and carefully spread across top and sides. Refrigerate until set, about 2 hours. Let stand at room temperature 30 minutes. Just before serving, remove parchment frame, and garnish with amaretti cookies. 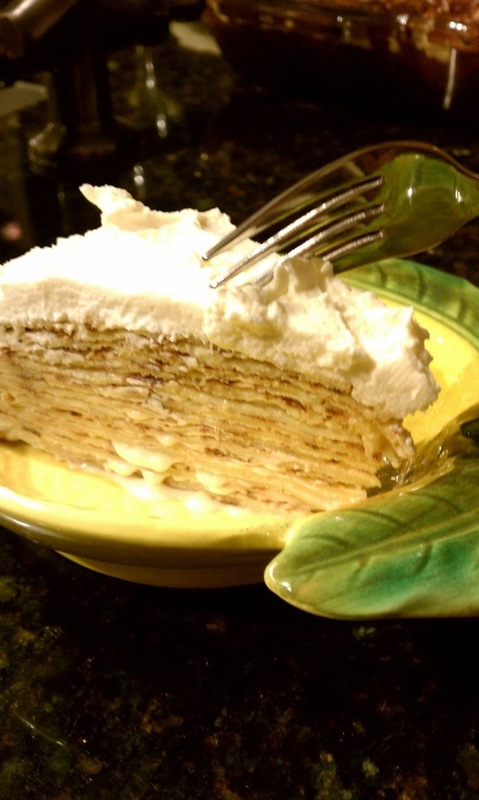 Crepe Expectations About 20 crepes sandwiched with lemon curd cream and thickly topped with mascarpone cream take the concept of layer cake to the next level. *side note* Hanna used a high quality jarred lemon curd and it worked just as well! And the apron she is wearing my sister Becky made it. ← My Results Are In! !